Have a question for Casa Privada? 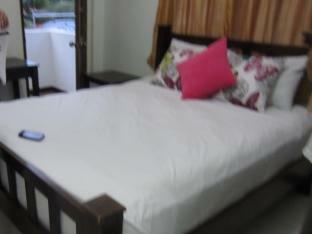 If what you're looking for is a conveniently located hotel in Palawan, look no further than Casa Privada. Situated only 19.9 Km from the city center, guests are well located to enjoy the town's attractions and activities. Visitors to the hotel can take pleasure in touring the city's top attractions: Puerto princesa city colesium, Robinson's Place Puerto Princesa, Puerto Princesa Airport. Casa Privada offers impeccable service and all the essential amenities to invigorate travelers. The hotel provides Wi-Fi in public areas, airport transfer, laundry service, bar to ensure our guests the greatest comfort. Hotel accommodations have been carefully appointed to the highest degree of comfort and convenience. In some of the rooms, guests can find internet access – wireless (complimentary), air conditioning, television, shared bathroom. The complete list of recreational facilities is available at the hotel, including garden. Discover an engaging blend of professional service and a wide array of features at Casa Privada.